Monarch butterfly and forestry scientists, a litigant in the border wall dispute, and an activist journalist who has taken Monsanto to task will gather to discuss the future of the Americas’ most iconic insect October 19 at Butterflies without Borders: The Monarch Butterfly Migration and our Changing Climate. The luncheon forum will launch the third annual Monarch Butterfly and Pollinator Festival and is hosted by the Texas Butterfly Ranch and the Rivard Report. The forum will tackle issues such as the status of the monarch butterfly population, the influence of GMOs and pesticides on the past and future of the migration, availability of nectar and host plants, and climate change in another year that will likely be the hottest in recorded history. Taking place just two-and-a-half weeks before the 2018 midterm elections, politics also will be part of the discussion–specifically, the controversial border wall proposed by the Trump Administration. Panelist Mariana Treviño Wright, Executive Director of the National Butterfly Center in MIssion, Texas, continues to fight Homeland Security in a lawsuit that challenges the legality of the border wall dividing the 25-year-old butterfly preserve she oversees. Award-winning journalist Robert Rivard will moderate the discussion. We look forward to seeing you at the Pearl Stable, Friday, October 19, 2018, 11:30 AM – 1:30 PM. Sponsorship opportunities and tickets are available here. Karen Oberhauser, Steering Committee Co-Chair of Monarch Joint Venture and Director of the Arboretum in Madison, Wisconsin. Oberhauser, long associated with monarch butterfly research and conservation, holds a PhD in ecology and is a co-chair of the Monarch Joint Venture, a conservation collaborative. The MJV helps to coordinate and communicate the work of over 70 U.S. government agencies, nonprofits, and academic programs dedicated to monarch butterfly conservation. Currently she serves as director of the Arboretum in Madison, Wisconsin, a position formerly held by Aldo Leopold. Read more about Oberhauser here. Marianna Treviño Wright , Executive Director of the National Butterfly Center, Mission, Texas. In July of 2017, Treviño Wright was making the rounds at the 100-acre butterfly preserve she oversees along the Rio Grande on the Texas -Mexico border when she encountered government contractors clearing brush for a future border wall. Since, the nonprofit organization has filed a lawsuit against Homeland Security, demanding the administration of President Donald Trump follow due process before proceeding with a border wall on private property. The lawsuit is pending. More on Treviño Wright. Rebeca Quiñonez Piñon, Monarch Outreach Coordinator, National Wildlife Federation, Austin, Texas. Quiñonez-Piñón, a native of Mexico City with family from Michoacán, is a forest hydrologist with a PhD in Geomatics Engineering. She collaborates with Texas Cities along the monarch butterfly central flyway to encourage appropriate conservation actions to increase the monarch population. 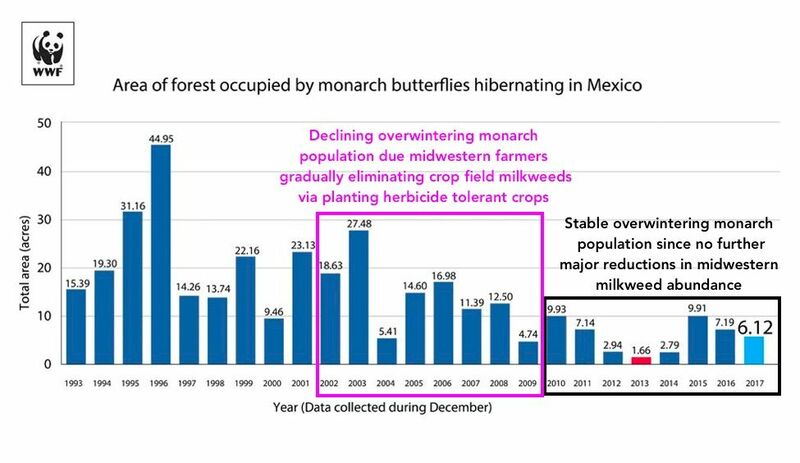 Prior to NWF, she served as executive director of Forests for Monarchs, an initiative to protect the monarch overwintering forests in Mexico. Carey Gillam, author of “Whitewash: The Story of a Weed Killer, Cancer and the Corruption of Science,” Kansas City, Missouri. Veteran journalist Gillam serves as Research Director for the non-profit US Right to Know. She worked for Reuters for 17 years covering corporate America and agriculture. Her recent book reveals secretive strategies employed by Monsanto and industry allies to promote pesticides such as Roundup that endanger human and environmental health, including monarch butterflies and other pollinators in their primary summer feeding and breeding grounds in the Midwest. More on Gillam here. Rivard will serve as moderator. The former newspaper man, award-winning foreign correspondent and author of Trail of Feathers, currently runs the thriving nonprofit, San Antonio-centric news website, the Rivard Report. Rivard knows his butterflies. He is married to Texas Butterfly Ranch founder Monika Maeckle. Tickets on sale here. Want to sponsor? Please contact Katy Silva at katy@rivardreport.com. The eastern monarch overwintering population has actually exhibited stability the past 8 years: https://imageshack.com/a/img923/3720/nb8gWN.jpg And since the summer breeding population in the upper Midwest and Great Lakes regions this summer has been extra large (so far as of July 27), the midwestern fall migration this year should be extra large as well as should the overwintering population in Mexico.